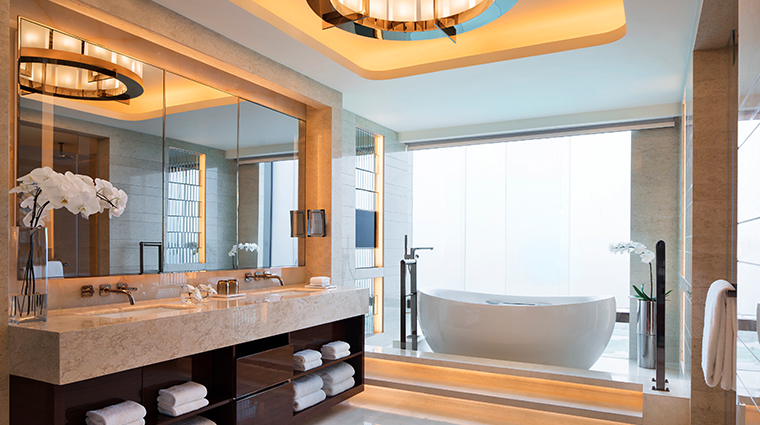 The lavish JW Marriott Hotel Macau doesn’t lack for luxury amenities, putting it right up there with the best of Macau’s glamorous hotels. 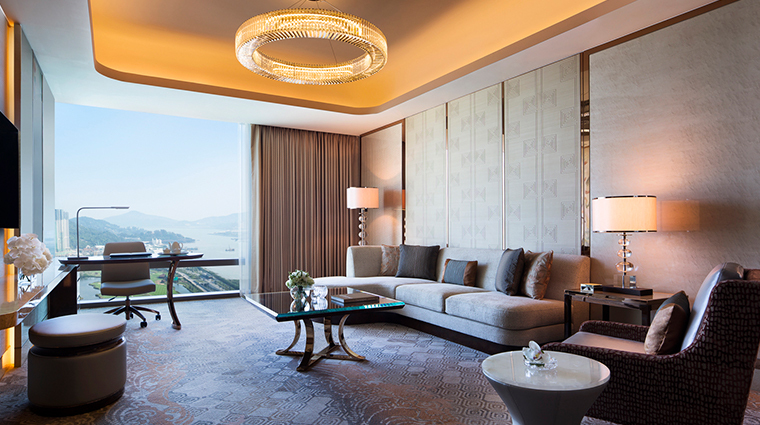 It is it the international brand’s largest flagship hotel in Asia and is home to a vast array of entertainment options, culinary experiences and wellness retreats all in an opulent setting. 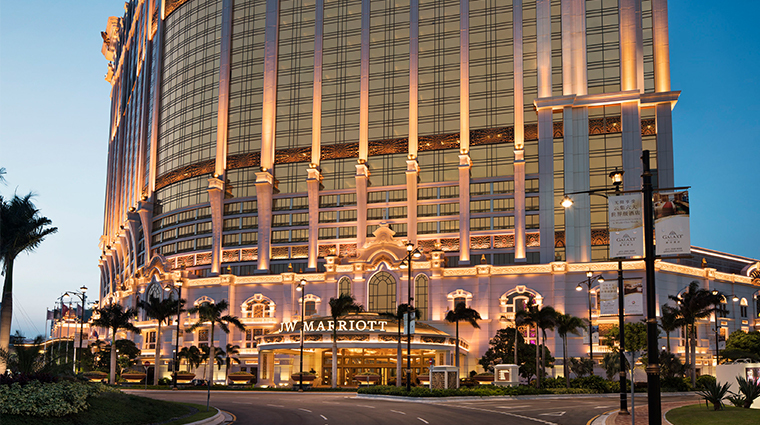 Part of the Galaxy Macau complex, the JW Marriott has an ideal location in the center of the Cotai Strip. 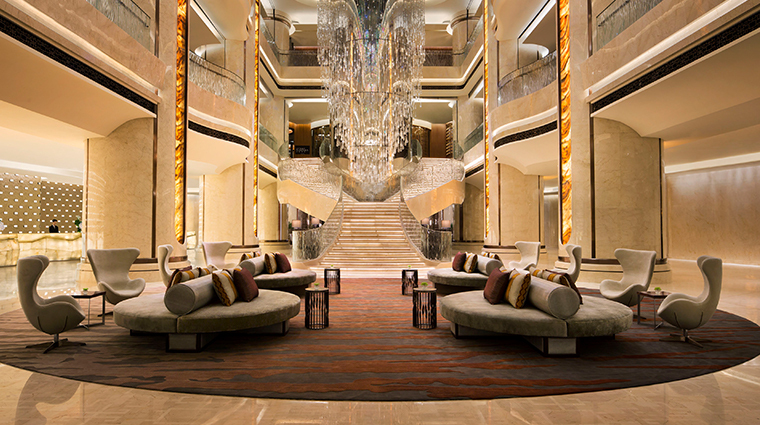 The atrium-style lobby invites you in with a majestic stairwell featuring eye-catching art installations. 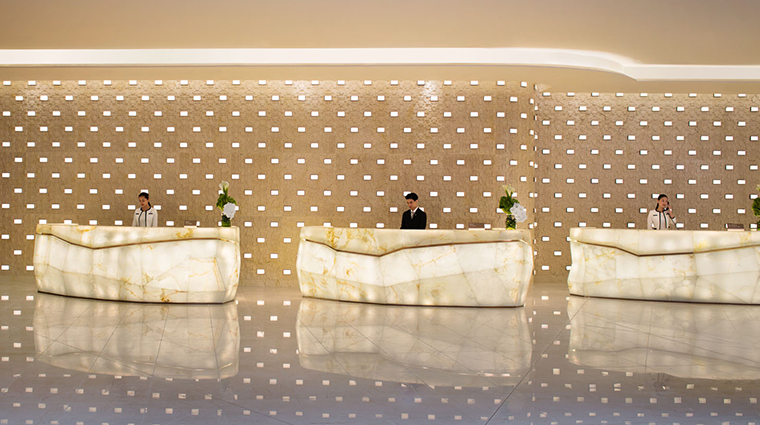 Every detail seems to have been carefully orchestrated, from the white jade onyx check-in counters to the plush furniture that ties it all together. 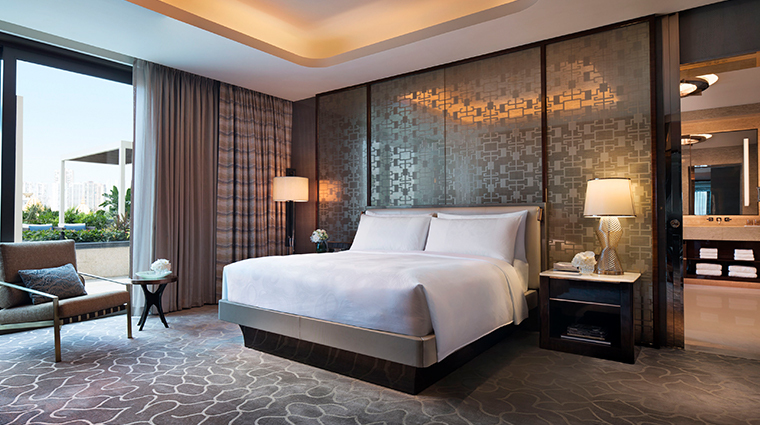 The neutral palette comes to life with accents of shiny brass and rose gold — a glamorous look that continues throughout the Macau hotel. You won’t go hungry here. 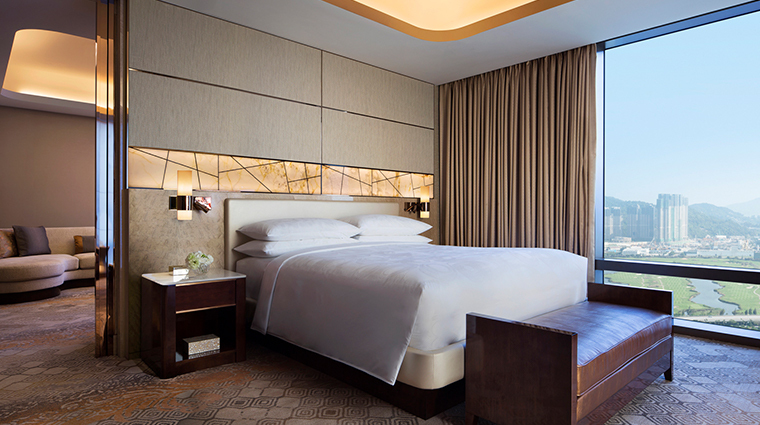 The ambitious luxury hotel knows how food can impact an experience, and has taken care to develop several impressive culinary concepts with its team of all-star team of chefs. Shopaholics will appreciate the wonderland of shops inside the comprehensive Promenade mall, which is connected to the hotel’s lobby. 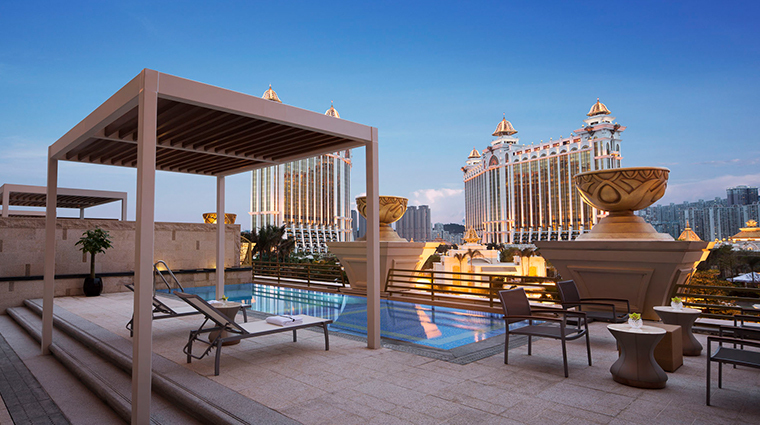 One of the most appealing aspects of the JW Marriott Macau is the easy access to Galaxy Macau’s Grand Resort Deck, home to the world’s largest rooftop wave pool, manmade sand beach, world’s longest Skytop Adventure Rapids, waterslide, Jacuzzis, various pool bars and more. 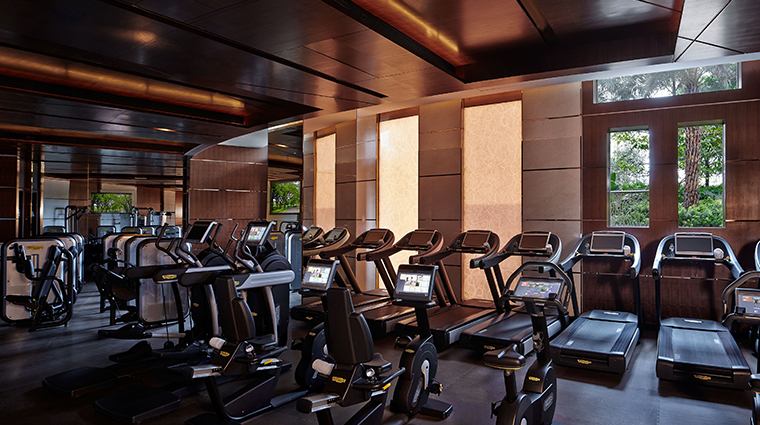 Those traveling with children will appreciate the expansive JW Kids’ Club — picture 8,611 square feet of interactive activities, entertainment and even a hair salon all geared toward children. 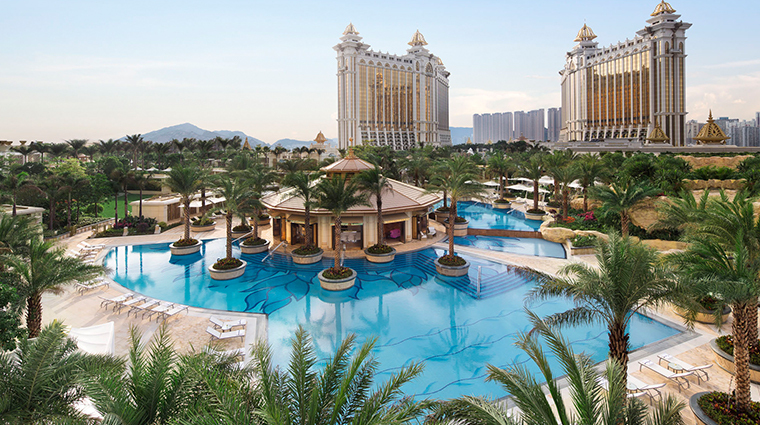 Nothing’s too far away in Macau, and the hotel’s Cotai locale serves as a convenient home base for exploring the territory’s cultural and culinary offerings. 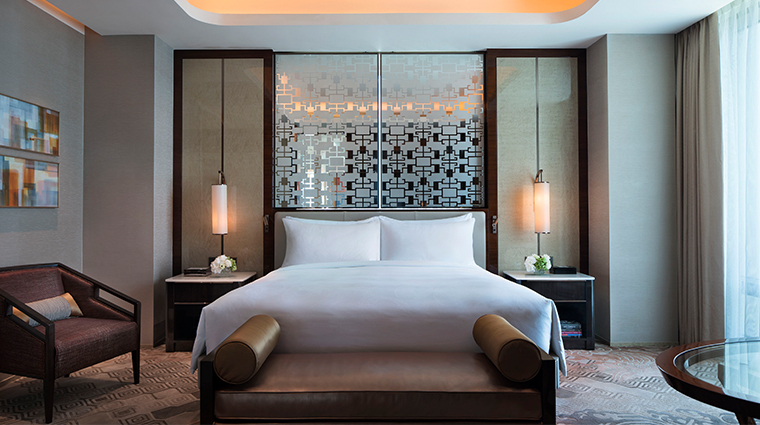 The hotel shares the top-notch ESPA spa with The Ritz-Carlton, Macau, and you can expect top-of-the-line relaxation facilities and pampering. On the southern side of the peninsula lies Coloane, a charming colonial village that’s home to the famous egg tarts at Lord Stow’s Bakery. 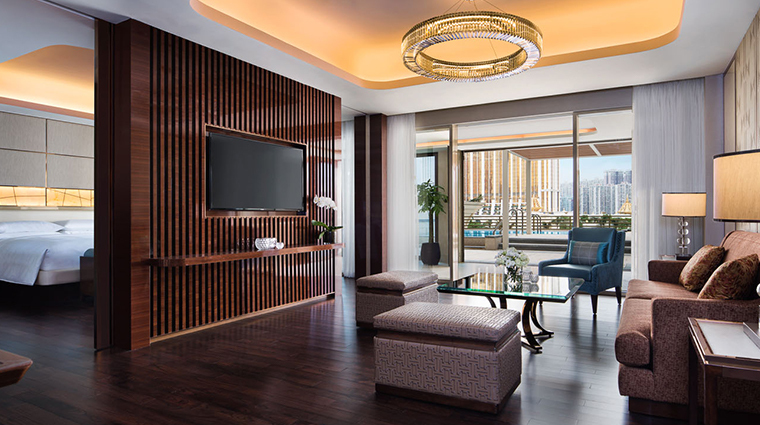 The Retreat Studio and Retreat Pool Suite both feature plunge and whirlpools, plus private patios that look out over Macau. 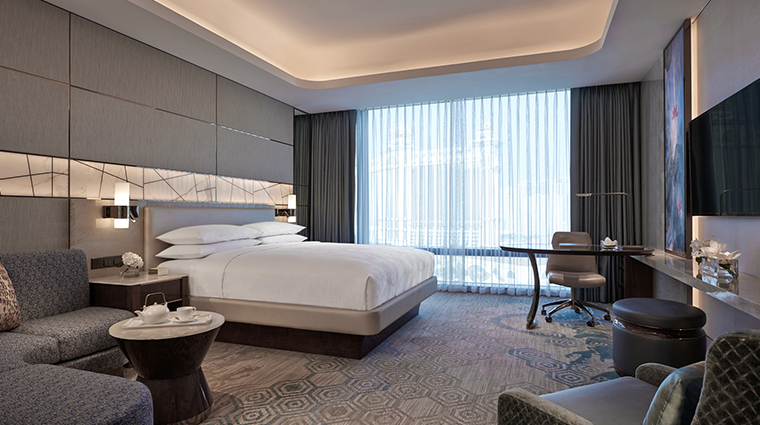 Awash in neutral shades with accents of calming blues and greens, the standard rooms are spacious and start at 484 square feet. 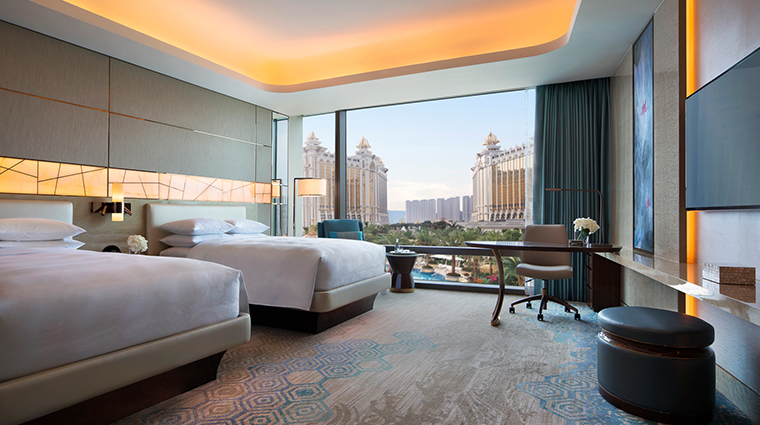 Each of the 1,015 rooms and suites features 10-foot-high ceilings, contemporary furnishings, luxurious bedding and impressive views of the Grand Resort Deck and/or Cotai skyline. 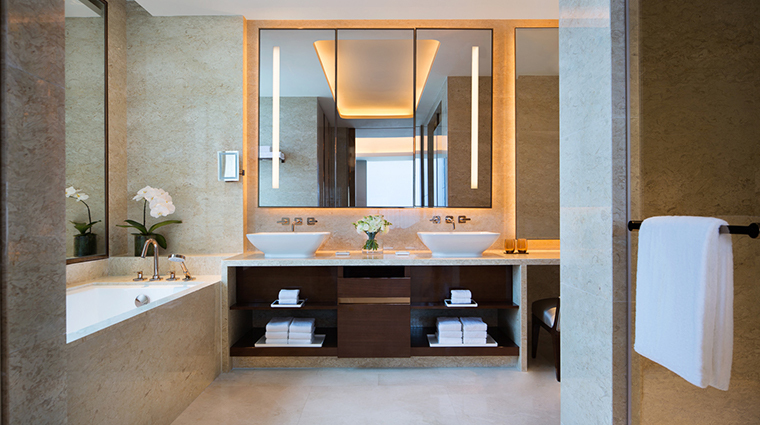 There are lots of modern tech touches as well, particularly in the bathroom, where travelers will find a TV built into the mirror and a see-through glass that turns opaque at the touch of a button. 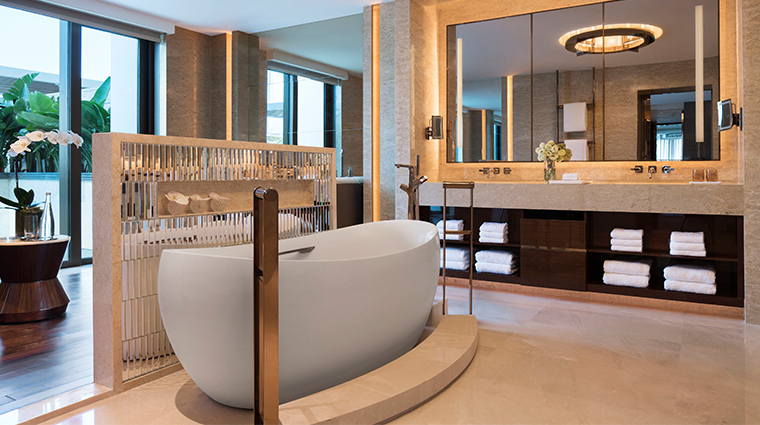 The Presidential Suite is, of course, the most impressive, boasting 3,100 square feet of living space, a massive outdoor terrace, a private plunge pool, seven TVs, two whirlpools and a custom bar. One of the most popular eateries is Man Ho Chinese Restaurant. 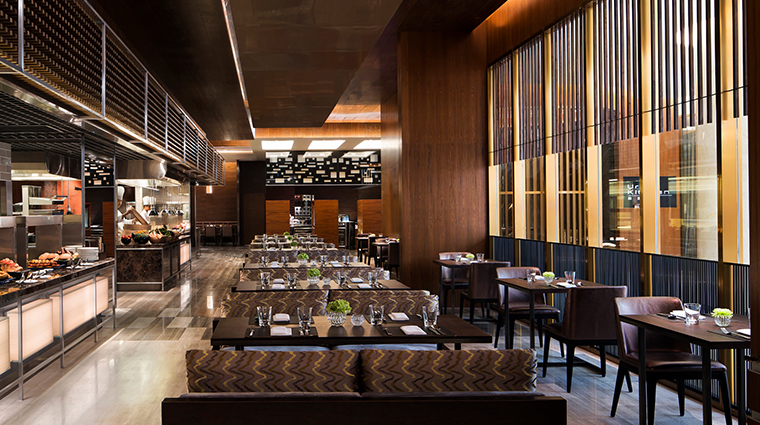 This signature Cantonese spot offers a memorable dining experience serving a regional menu and dim sum in a contemporary, gilded atmosphere.For a more casual outing, hit up Urban Kitchen, an all-day dining destination that’s chock-full of international and regional dishes on the lively buffet. 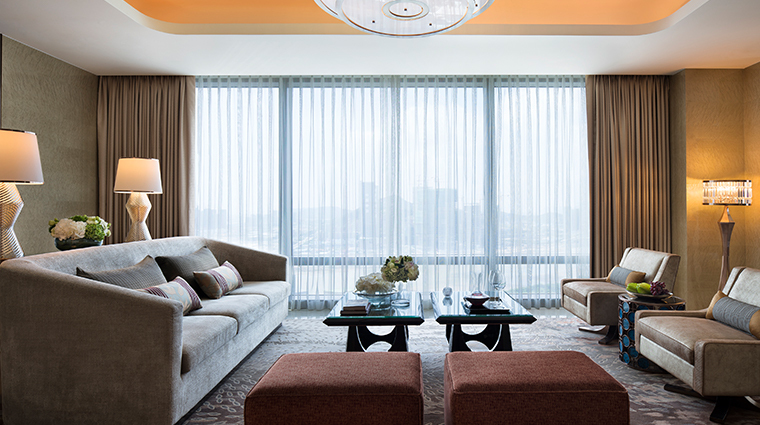 Not to be missed is the versatile Lounge, outfitted with a glitzy raindrop-inspired chandelier. 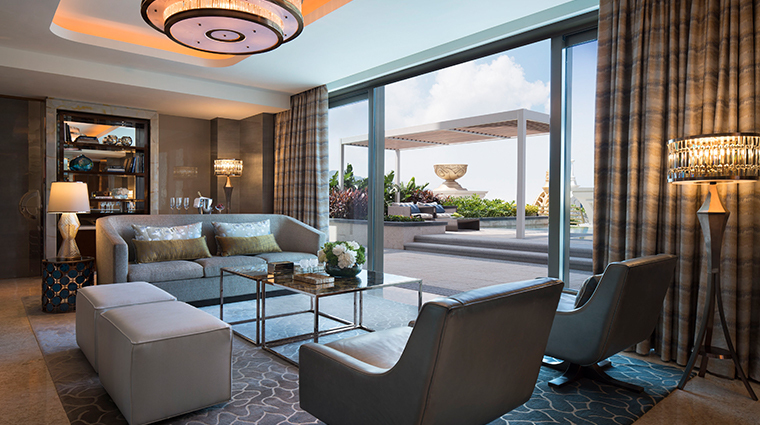 The restaurant and bar is a peaceful spot for handcrafted cappuccinos and afternoon tea. The fourth dining option is The Pool Bar, an alfresco spot that serves up sandwiches, salads and fresh juices.